Jason-1 is a satellite oceanography mission to monitor global ocean circulation, study the ties between the ocean and the atmosphere, improve global climate forecasts and predictions, and monitor events such as El Niño and ocean eddies. The lineage of the name begins with the JASO1 meeting (JASO = Journées Altimétriques Satellitaires pour l'Océanographie) in Toulouse, France to study the problems of assimilating altimeter data in models. Jason as an acronym also stands for "Joint Altimetry Satellite Oceanography Network". Additionally it is used to reference the mythical quest for knowledge of Jason and the Argonauts. It is the successor to the TOPEX/Poseidon mission, which measured ocean surface topography from 1992 through 2005. Like its predecessor, Jason-1 is a joint project between the NASA (United States) and CNES (France) space agencies. Jason-1's successor, the Ocean Surface Topography Mission on the Jason-2 satellite, was launched in June 2008. These satellites provide a unique global view of the oceans that is impossible to acquire using traditional ship-based sampling. Jason-1 was designed to measure climate change through very precise millimeter-per-year measurements of global sea level changes. As did TOPEX/Poseidon, Jason-1 uses an altimeter to measure the hills and valleys of the ocean's surface. These measurements of sea surface topography allow scientists to calculate the speed and direction of ocean currents and monitor global ocean circulation. The global ocean is Earth's primary storehouse of solar energy. Jason-1's measurements of sea surface height reveal where this heat is stored, how it moves around Earth by ocean currents, and how these processes affect weather and climate. Jason-1 was launched on December 7, 2001 from California's Vandenberg Air Force Base aboard a Delta II rocket. During the first months Jason-1 shared an almost identical orbit to TOPEX/Poseidon, which allowed for cross calibration. At the end of this period, the older satellite was moved to a new orbit midway between each Jason ground track. Jason has a repeat cycle of 10 days. Orbit maneuvers in 2009 put the Jason-1 satellite on the opposite side of Earth from the Jason-2 satellite, which is operated by the U.S. and French weather agencies. Jason-1 now flies over the same region of the ocean that Jason-2 flew over five days earlier. Its ground tracks fall midway between those of Jason-2, which are about 315 kilometers (196 mi) apart at the equator. This interleaved tandem mission provides twice the number of measurements of the ocean's surface, bringing smaller features such as ocean eddies into view. The tandem mission also helps pave the way for a future ocean altimeter mission that would collect much more detailed data with its single instrument than the two Jason satellites now do together. The program is named after the Greek mythological hero Jason. Poseidon 2 - Nadir pointing Radar Altimeter using C band and Ku band for measuring height above sea surface. DORIS (Doppler Orbitography and Radiopositioning Integrated by Satellite) for orbit determination to within 10 cm or less and ionospheric correction data for Poseidon 2. Laser retroreflector array works with ground stations to track the satellite and calibrate and verify altimeter measurements. The Jason-1 satellite, its altimeter instrument and a position-tracking antenna were built in France. The radiometer, Global Positioning System receiver and laser retroreflector array were built in the United States. TOPEX/Poseidon and Jason-1 have led to major advances in the science of physical oceanography and in climate studies. Their 15-year data record of ocean surface topography has provided the first opportunity to observe and understand the global change of ocean circulation and sea level. The results have improved the understanding of the role of the ocean in climate change and improved weather and climate predictions. 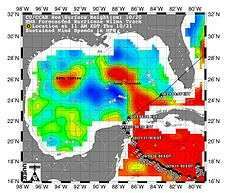 Data from these missions are used to improve ocean models, forecast hurricane intensity, and identify and track large ocean/atmosphere phenomena such as El Niño and La Niña. The data are also used every day in applications as diverse as routing ships, improving the safety and efficiency of offshore industry operations, managing fisheries, and tracking marine mammals. The missions revealed the surprising variability of the ocean, how much it changes from season to season, year to year, decade to decade and on even longer time scales. 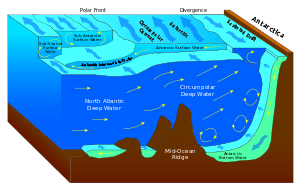 They ended the traditional notion of a quasi-steady, large-scale pattern of global ocean circulation by proving that the ocean is changing rapidly on all scales, from huge features such as El Niño and La Niña, which can cover the entire equatorial Pacific, to tiny eddies swirling off the large Gulf Stream in the Atlantic. Measurements by Jason-1 indicate that mean sea level has been rising at an average rate of 2.28 millimeters (.09 inches) per year since 2001. This is somewhat less than the rate measured by the earlier TOPEX/Poseidon mission, but over four times the rate measured by the later Envisat mission. Mean sea level measurements from Jason-1 are continuously graphed at the Centre National d'Etudes Spatiales web site, on the Aviso page. 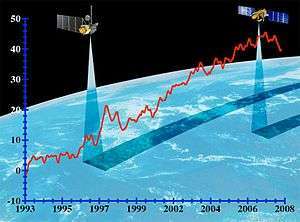 A composite sea level graph, using data from several satellites, is also available on that site. TOPEX/Poseidon and Jason-1 made clear the importance of planetary-scale waves, such as Rossby and Kalvin waves. No one had realized how widespread these waves are. Thousands of kilometers wide, these waves are driven by wind under the influence of Earth’s rotation and are important mechanisms for transmitting climate signals across the large ocean basins. At high latitudes, they travel twice as fast as scientists believed previously, showing the ocean responds much more quickly to climate changes than was known before these missions. TOPEX/Poseidon and Jason-1 data are available at the University of Colorado Center for Astrodynamics Research, NASA's Physical Oceanography Distributed Active Archive Center, and the French data archive center AVISO. Climate Research: Altimetry data are incorporated into computer models to understand and predict changes in the distribution of heat in the ocean, a key element of climate. El Niño & La Niña Forecasting: Understanding the pattern and effects of climate cycles such as El Niño helps predict and mitigate the disastrous effects of floods and drought. Hurricane Forecasting: Altimeter data and satellite ocean wind data are incorporated into atmospheric models for hurricane season forecasting and individual storm severity. Ship Routing: Maps of ocean currents, eddies, and vector winds are used in commercial shipping and recreational yachting to optimize routes. Offshore Industries: Cable-laying vessels and offshore oil operations require accurate knowledge of ocean circulation patterns to minimize impacts from strong currents. Marine Debris Tracking: The amount of floating and partially submerged material, including nets, timber and ship debris, is increasing with human population. Altimetry can help locate these hazardous materials. Argo, a project to measure the temperature and salinity of the upper 2 km of the water column. TOPEX/Poseidon- the immediate predecessor to Jason-1. Ocean Surface Topography Mission/Jason-2 - the immediate successor to Jason-1. ↑ "Jason Sets Sail; Satellite to Spot Sea's Solar/Atmospheric Seesaw". NASA/JPL. ↑ ""The Legacy of Topex/Poseidon and Jason 1", page 30. Ocean Surface Topography Mission/Jason 2 Launch Press Kit, June 2008" (PDF). NASA/JPL. ↑ "CCAR Near Real-time Altimetry Data Homepage". University of Colorado. ↑ "Physical Oceanography DAAC". NASA.